Iran is the world’s 18th most populous country, and it’s a major player in both Middle Eastern and world politics. However, most mentions of Iran in the news focus on some of the many problems the country is facing, such as its controversial nuclear program, undemocratic government, and harsh gender divide. But Iran, or Persia, as it was called until 1935, was once the second largest empire on Earth, and it has played an important role in the world since ancient times. The history of Iran starts with the Achaemenid Empire, which began in the 6th century BCE (c. 550) and lasted until Alexander the Great marched his armies through Persia in 330 BCE. 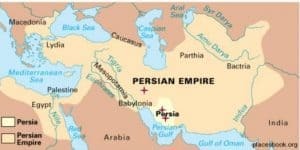 However, after the fall of this great empire, Persia continued to be a strong regional and global power, largely because of its strategic position along the trade routes connecting Europe and Asia. Because of this, Iran still holds an influential position on the global stage. But to truly understand this country, it’s important to first look at its role in the ancient world. This review of Persian history starts by locating Persia on a map and discussing the origins of Persian people, and then it highlights some of the key developments in Persian history, as well as its role in shaping the world we live in today. Persia was the ancient name for the territory we now recognize to be the modern-day nation of Iran. It is located just to the east of the Persian Gulf, on a piece of land known as the Iranian Plateau. The first Persian capital, Pasargadae, which was founded sometime in the 7th century BCE, is located in the modern-day region of Fars, which is in the southern part of today’s Iran. Persia, then, refers to the area immediately surrounding Pasargadae. Other cities, such as Persepolis and Susa, other Persian capitals, were founded later on and became important political and cultural centers within Persia. These three cities are marked on the map below with red stars, starting with Susa in the north, then Persepolis, and then Pasargadae. However, during ancient times, Persia would have included nearly all of Mesopotamia, as well as parts of modern-day Egypt, Turkey, Greece, Armenia, Turkmenistan, and Afghanistan, among others. The map below shows the extent of the Persian Empire at its peak, as well as the territory surrounding the capital that was the original Persia. Persians are a subgroup of the Iranians, which is an ethno-linguistic group used to describe a wide range of different people who all spoke some variation of the Iranian language. Iranians began living in the region that is now Iran most likely in the 10th century BCE, and they are believed to have been the descendents of certain Aryan groups living in northern Europe. The Iranian language is part of the Indo-European language group, which connects diverse languages such as Hindi, Spanish, German, French, Punjab, and many others. Today, we understand Persian people to be those who speak Persian, which is often called Farsi, and/or who identify with Persian culture. Over half of the population of Iran is Persian, which amounts to about 25 million people, but Persian people can be found living all throughout Western Asia, specifically in Afghanistan, Tajikistan, Uzbekistan, and Azerbaijan. In fact, some of the most prominent figures in Persian history came from areas outside of the region known as Persia. One of the main reason we consider Persia to be an important part of ancient, as well as modern, history is because of the Achaemenid Empire, which was the first dynasty in Persia, and also the one that helped Persia conquer one of the largest empires in history. The Achaemenid Empire began when King Cyrus II, who would later be known as Cyrus the Great, united the various Persian tribes living on the Iranian plateau. They immediately waged war against the Medes, an ethnically similar people who had built a strong kingdom throughout northern Iran, Turkmenistan and Afghanistan, and they were conquered by 550 BCE. Afterwards, Cyrus the Great immediately set his sights on the other major powers of the region, mainly Lydia, which is located in modern-day Turkey, and Babylonia, which held the territory in between the Tigris and Euphrates Rivers known as Mesopotamia. By 547 BCE, Cyrus the Great had subjugated these two powerful kingdoms, and the Persians became the dominant force in the ancient world. His son, Cambyses II, who came to the Persian throne in 525 BCE, managed to extend the Persian Empire out into Egypt and Libya, as well as parts of Greece. It ushered in the era of Persian satraps. These were essentially regional governors who had extraordinary power. The success of these institutions, along with the Persian’s commitment to building roads and raising armies, is what helped the Persians remain the dominant force in the region for so long. It launched the Greco-Persian War. This conflict, which lasted roughly 50 years, played a major role in Persian history, largely because it ended their attempts to expand westward through Greece. Susa became the Persian capital. 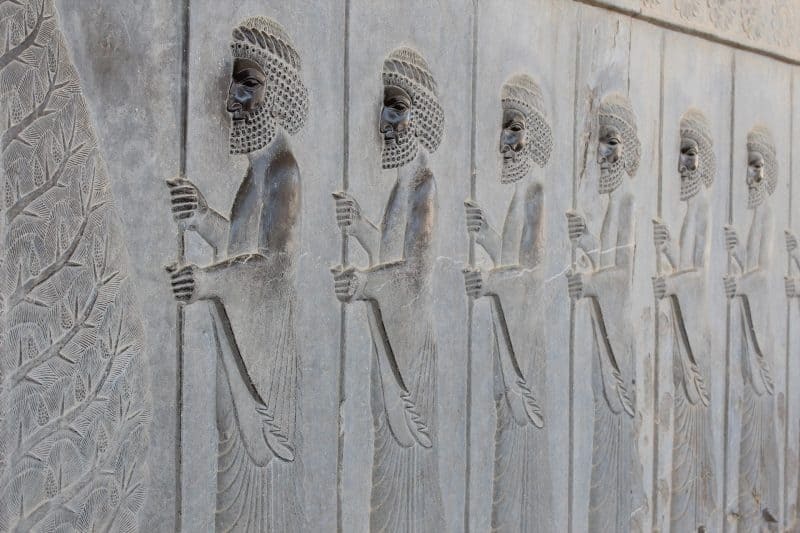 Located further north than Persepolis and Pasargadae, Susa was chosen to be the Persian capital because it was connected to the King’s Road, also constructed by Darius I, which made it easier for the Persian monarch to move about and govern his empire. When Darius I took over as king in 522 BCE, he spent most of his time consolidating the gains of his predecessors. However, by the end of the 6th century BCE, he began to look for ways to expand his empire, and Greece was a natural target. Its rich culture and relative lack of political cohesion made it a tempting prize. Darius I attempted to invade Greece with the support of a Greek tyrant, Aristagoras, but their attack failed miserably. Aristagoras, fearful that his fellow Greeks would seek revenge, and that Darius I would try to punish him, encouraged the Greeks living in Persian-controlled Turkey to revolt against Darius I, which they did. 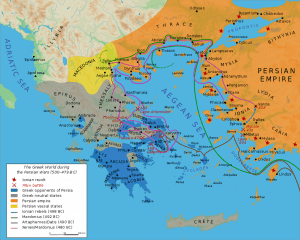 These revolts, which became known as the Ionian Revolt, took place between 499 and 493 BCE, and they ended with the Greeks sacking the Persian regional capital of Sardis. Enraged at this rebellion, Darius I decided to launch a full-scale invasion of Greece. He pulled together a fleet of Egyptians and Phoenicians, and summoned his armies from all around the empire. He sent his fleet through the Aegean Sea towards Athens and Eritrea, and they reached Eritrea, burning it to the ground. However, his army was stopped before it could reach mainland Greece, and the Greek army, although outnumbered, managed to win the decisive Battle of Marathon in 490 BCE. This effectively ended the Persian attack, and it was officially stalled when Darius I died in 487 BCE. Xerxes is perhaps one of the most well-known characters of the ancient age. He was famous for his taste in harems, and his arrogance was known throughout the land. Xerxes was the “god king,” and all who came in his way had to bow. However, when Xerxes first came to power, he was not particularly interested in conquering more territory. He spent the first part of his time as emperor consolidating his realm. Revolt during this period of time was frequent, and it occupied most of a king’s time. But by 480 BCE, this had changed. Convinced by some of his advisors that Greece must die, Xerxes summoned one of the largest armies ever. Some estimates suggest the force totaled 180,000 men. He also put together a fleet of Egyptians and Phoenicians, with the goal being to march on Athens and perhaps even Sparta, so as to bring the Greeks completely under his control. Initially, he was quite successful. He managed to round the Thracian coast (the territory to the North of the Aegean Sea) and march down onto the Greek mainland, something Darius I had been unable to do. However, key defeats against the Spartan-led force at the Battle of Thermopylae (the plot of the movie 300), and against the Athenian-led navy at Plataea and Mycale, ended the Persian invasion once and for all. See the map below to learn more about Persian movements in Greece under Xerxes. Artaxerxes I (c. 467-424 BCE) continued to battle the Greeks until 450 BCE. Most of these battles, though, took place in Egypt, where the Athenian-led Delian League was supporting rebellions designed to overthrow Persian rule. He helped to negotiate the Peace of Callias, which ended the half-century conflict between the Greeks and the Persians. Artaxerxes II (c. 412-358 BCE) took over Persia during a period of great instability. Twelve years passed between the death of Artaxerxes I and the coronation of Artaxerxes II, and this is because of a lack of clarity over who was the rightful heir. War and rebellion defined this period, and it also defined the reign of Artaxerxes II. Most of the Persian empire was at risk, and while Artaxerxes II managed to put down most of the rebellions and restore order, he lost control over Egypt. Artaxerxes III (c. 358-338 BCE) presided over Persia’s last stand. He managed to once again bring Egypt back under his control, and he also won victories in Asia Minor (modern-day Turkey), which helped him secure control in the region. However, he had been forced to recognize a treaty with the Greeks that protected their sovereignty, and this would set the stage for Persia’s ultimate demise. Artaxerxes IV, Darius III, and Artaxerxes V (c. 338-330 BCE) were the last three kings of the Achaemenid Empire, and they ruled over intense turmoil. Artaxerxes IV was king for just two years before he was killed in battle. His predecessor, Darius III, lasted just 6 years before being killed by Artaxerxes V, who was killed a year later by Alexander III of Macedon, also known as Alexander the Great, which subjugated the Persians to the Greeks and ended this chapter of Persian history. Today, the primary religion in Iran is Islam, specifically Shi’a Islam. However, this was not always the case. For most of ancient Persian history, the main religion was Zoroastrianism, which is considered to be the world’s first monotheistic religion. It is named after Zoroaster, who was a prophet that began spreading his beliefs starting in the 10th century BCE. By the time of the Achaemenid Empire, Zoroastrianism was deeply entrenched in Persian culture, and it became the empire’s official religion under Artaxerxes II (c. 412 BCE). The roots of Zoroastrianism can be traced to the ancient pagan religions of the Aryan people, but many of its central tenets are similar to those of today’s main monotheistic religions. For one, Zoroastrianism is focused on the concept of duality, meaning that it sees the world as being locked in a struggle between good and evil, and that the end of times will come with the eventual triumph of good. The main god in Zoroastrianism is Ahura Mazda, which translates to “Wise Lord.” It is believed that he manifests himself through divine entities, which are similar to saints in Christianity. Ahura Mazda has no evil inside, and his primary duty is to help humanity overcome the forces of evil. After the emergence of Islam, Zoroastrianism was oppressed, and its followers dwindled. Today, it’s estimated that there are some 200,000 Zoroastrians still practicing, mostly in Iran and India. In popular culture, Zoroastrianism has made several appearances. German philosopher Friedrich Nietzsche’s book Thus Spoke Zarathustra, draws heavily on the faith, and more recently, Freddie Mercury, the leader singer of the rock band Queen, grew up in a home of practicing Zoroastrians. After the fall of the Achaemenid Dynasty, the Persians fell into the background of ancient history. They became a part of the Alexander the Great’s empire, but then when that fell in c. 240 BCE, the Persians became vassals of the Seleucid Empire. . However, this didn’t last long, and the Persians once again became autonomous under the royal family of the Parthians, who placed their capital in northeastern Iran. They managed to make modest territorial gains, but their main achievement was bringing Persepolis, Pasargadae, and Susa (the Persian capital under Darius I) back under Persian control. However, the Parthians were contemporaries of the Romans, and this seriously hindered their ability to expand their influence. The Parthians ruled for a period of 400 years, and then they gave way to the Sassanids, who came to power in c. 224 CE. The fall of Rome meant there was territory to be gained, and the Sassanids fought frequently with the Eastern Roman empire, which eventually became the Byzantine Empire. At one point, they laid siege to Constantinople and annexed Byzantine territory, although it’s unclear to what extent they were able to actually control these lands. Despite this, though, the Sassanids managed to extend the Persian empire considerably. The map below shows the extent of their imperial expansion. Perhaps the most significant thing to come out of these two periods in Persian history was that Persia established itself as a cultural center of the ancient world. This is due in large part to its geography, which allowed it to serve as a key trading point between Europe and Asia. During this time, Persian paintings, sculptures, and decorative textiles (rugs and tapestries) became hot commodities all around the world, and this fueled the growth of these industries. Many of us are aware of the prestige of Persian rugs, and it’s during this time that this becomes a key feature of Persian culture. Many also claim the art that came out of the Sassanid Dynasty was a precursor to Muslim art, which would become one of the most influential artistic traditions in the whole world. 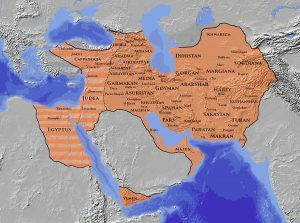 After the fall of the Sassanid dynasty in c. 651 CE, the Persians became a part of the Muslim world. Their religion, Zoroastrianism, was suppressed, and they were forced to acknowledge the Muslim caliphate that was installed to rule Persia. The Arab empire would eventually fall, but Islam remains the dominant religion in the region up until the current day. Persians regained control over their territory in 1501 with the rise of the Safavid dynasty. Their main accomplishment during this time was fortifying the Persian border with the Ottoman Empire, which helped to secure the territory that is now Iran. The Safavid Dynasty, along with the Ottomans and the Mughals in India, were one of the Gunpowder Empires. Their mastery of this technology helped them become and remain a dominant force in the region. The Safavid dynasty lasted until 1736 when the Russians and Ottomans teamed up to topple the Persians and divide up their territory. At this point in time, the Dutch East India Company, as well as the British navy, also began meddling in the area, reducing Persian power and leading to its collapse. However, the Persians managed to bounce back and claim sovereignty over their own territory under the Qajar dynasty, which rose to power in 1789. The Qajar family helped to create the borders of Iran we see today, and they also enacted policies that led to Iran’s modernization and industrialization. But they were heavily criticized for how they succumbed to foreign powers, mainly the British and the Russians, and it’s argued that much of the anti-western sentiment in Iran has its roots in this moment in history. Most of Iran’s trade was controlled by someone other than Iran, and this significantly limited their ability to grow their influence. The Qajar family still exists today, but they have no power. They were forced to convert to a constitutional monarchy in the 1920s, which lasted until democracy was instituted during the Iranian Revolution of 1977. When Did Persia Become Iran? Persia became Iran in 1935 when the government of Persia asked all other countries to begin using the name Iran, which is the word for Persia in the Persian language. It is believed this may have been the result of Iranian ties to Nazi Germany, who would have supported this more nationalist name over a one that was technically foreign. Persian history is long and complex. However, there is no doubting that the Persians are one of the great stories of humankind. They rose from practically nothing in the 7th century BCE to go on and control one of the largest empires in the world, and they have managed to survive until the present day as the modern nation of Iran. Only time will tell what else the Persians have to add to the history of the world. Amanat, Abbas. Pivot of the Universe: Nasir al-Din Shah Qajar and the Iranian Monarchy, 1831-1896. Univ of California Press, 1997. Fisher, William Bayne; Avery, P.; Hambly, G. R. G; Melville, C. The Cambridge History of Iran. Cambridge University Press. Frye, Richard N. The Sassanians. Cambridge Ancient History Vol. 122 . Cambridge Univesity Press, 2005. Kuhrt, Amélie. The Persian Empire: A Corpus of Sources from the Achaemenid Period. Routledge, 2013. Nicolle, David; McBride, Angus. Sassanian Armies: The Iranian Empire Early 3rd to mid-7th centuries AD. Montvert Publications, 1996. Olmstead, Albert Ten Eyck. History of the Persian Empire. Vol. 108. Chicago: University of Chicago Press, 1948. Wiesehofer, Josef. Ancient Persia. IB Tauris, 2001.